Former Paralympic hand-cycling gold medallist Rachel Morris says she is looking to win another gold medal, but as a rower. The 35-year-old from Milford Haven has decided to swap a bike for a boat for the Olympics in Rio 2016. Morris won time trial gold at the Beijing Games in 2008 and followed that up with a bronze medal in the road race at London 2012. "That [winning a gold medal at Rio] is absolutely my aim," said Morris. It is going to be a very tough couple of years to do it and it will take an awful lot to do it. "It is going to be a very tough couple of years to do it and it will take an awful lot to do it. "Rebecca Romero went the other way from rowing to cycling and people have done it." GB Rowing lead coach for para-rowing, Tom Dyson, described Morris as "a consummate professional" but warned progress is not necessarily straightforward. Morris impressed at the Caversham trials and gained a place at a training camp in Italy ahead of the World Cup regatta in June and August's World Championships. 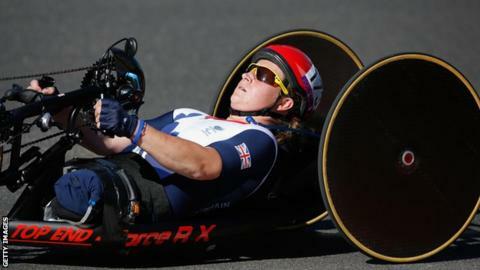 Having already competed at the Paralympics twice, she is hoping to represent Great Britain for a third time in Brazil. Morris explains that she was looking for a new challenge and that was the motivation for switching sports. "I felt I had achieved a lot and had a fantastic time in cycling and I have achieved everything I can in cycling," said Morris. "The opportunity came for the time trails in rowing and it gave me a totally new challenge, new motivation and a new focus. "It is very different but still an elite sport because I wasn't ready to retire."